Moss, Lichen and the black streaks better known as Gloecapsa Magma. All three of these growths can cause roof rot, shingle deterioration and prematurely age your roof. Aqua Boy’s Marlton Soft Wash Roof Cleaning can effectively remove these algae life forms with our state of the art low-pressure soft wash systems. These systems are designed with the use of a 12-volt pump to distribute our special blend of top-notch eco friendly soaps. 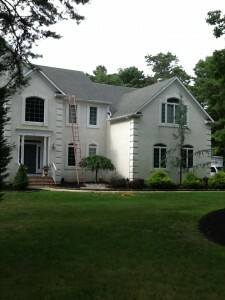 Aqua Boy Roof Cleaning is a family owned business that is located in the town of Marlton. 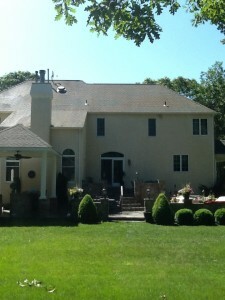 Aqua Boy Roof Cleaning has the highest reputation in the entire state of New Jersey, we are so sure that our Roof Cleaning Process will not only last you but is truly the best in the country. 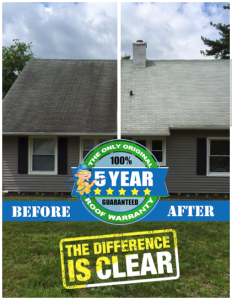 We back our entire roof cleaning with our 5-year original roof cleaning warranty. But don’t take our word for it… please visit our 267 – 5 Star Goolgle online reviews. When our home town residences call on Aqua Boy Power Washing for Roof Cleaning they will be met with excellent customer service from start to finish. 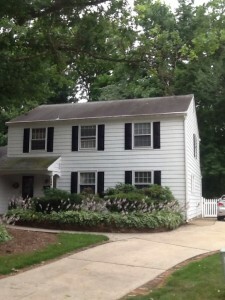 We provide same day professional written estimates. Our overall customer service cannot match outside companies targeting our area. Aqua Boy Power Washing will arrive at your residence with three highly trained uniformed staff. Each member has been classroom trained and field-tested to guarantee the absolute best results and safety standards. Most companies utilize two workers but we employ an additional worker who is designated to protect your entire landscaping during the entire cleaning process. Our main technician will distribute our special blend of detergents that will eradicate all those harmful living life forms on your Marlton Roof. 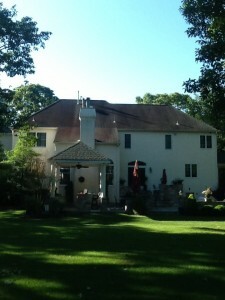 If Moss or Lichen is present on your Marlton Roof it should never be forced off, pressure washed off or scraped off. Moss can lift shingles and cause structural damage and possible leaks in your house. In the third picture above you can see Lichen growing on the shingle. Lichen typically forms a low crustlike, leaflike shade and will break down the granuls in the area its stationed in. Unfortunately, there are outside companies that will remove these growths to please the customer. This unprofessional way will damage your roof by removing a significant amounts of granules. 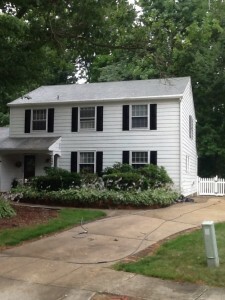 Soft Washing will kill these growths and maintain the integrity of your roof. During the application these growths will begin to die immediately and over time your roof will be restored to its natural state with the help of Mother Nature.